As the original drives are now 20+ years old and new repair-parts are long unavailable, it is no wonder that the number of working units is dwindling. This style of hard drive is essential for most Lisa operating environments and the Apple /// SOS, so a solution was sought to maintain operability of these legacy computers. We set out to develop a long-term solution to this problem, with emphasis on maximum compatibility, flexibility, and performance. The result is the X/ProFile. 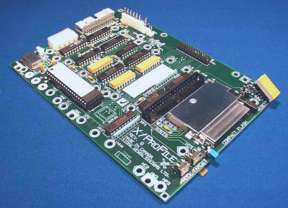 The X/ProFile provides an interface between the Apple parallel interface protocol and economical, readily available, and better performing IDE storage devices. Depending on your choice of storage device and installation, additional items will be required, such as a Compact Flash card or an IDE hard drive and IDE cable. If you are not replacing an existing parallel port hard drive (ProFile, Widget, Sun20), you will also require an appropriate data cable. The additional items that may be required are outlined in the Installation Manual, or contact Vintage Micros for assistance (use the links below). When installing in a Lisa computer: There are two main versions of the Lisa power supply, the higher capacity "DataPower" power supply is strongly recommended when any hard drive is installed internally in the Lisa, however working "DataPower" power supplies are in short supply. Compact Flash cards provide rugged and inexpensive storage, and of particular importance for those Lisa computers with the lower capacity power supply, CF cards have much low power consumption than hard drives, making internal installation of the X/ProFile practical. When installing in an original Apple ProFile case, the X/ProFile Regulator (available separately) is required. 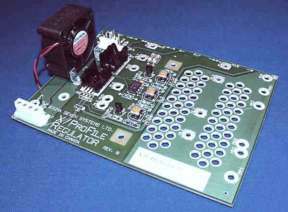 In addition to providing power supply regulation, the X/ProFile Regulator facilitates mounting a hard disk beside the original power supply. These manuals are in Acrobat PDF format. Requires Acrobat Reader 3.0 or later. Some issues are beyond the scope of the X/ProFile manuals and the technical support provided by your supplier. For example, you may want some help using a particular operating system, or need help troubleshooting a hardware problem with your computer that is unrelated to the X/ProFile. In these cases, the following links may be useful. These links are provided as a courtesy; the organizations and individuals responsible for these sites and services are not associated with Sigma Seven Systems Ltd. Copyright 2006, Sigma Seven Systems Ltd. All rights reserved. X/ProFile is a trademark of Sigma Seven Systems Ltd.
Apple, ProFile, Lisa, Mac, Macintosh, MacWorks, and MacOS are registered names of, trademarks of, or trademarks licensed to Apple Computer, Inc.
Other trademarks are of their respective owners.